For the last few weeks I've been in an "Organic Gardening" class at SCC and it's proving to be the highlight of my weeks. Taught by one of the owners of a local organic farm--a few miles Northwest of Lincoln, certified organic and biodynamic) who knows pretty much everything about organic. Among many interesting things I'm picking up (cover crops and composting have been our main topics thus far, pest control next week) I learned about compost teas and the very cool, horsetail. 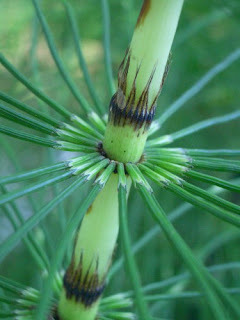 Because of the high silica content of the plant (easily harvested from almost any roadside ditch) horsetail can be made into a tea, fermented (which makes it even more potent) and sprayed directly onto plant's leaves to help prevent fungal diseases. I'm becoming so fascinated by all of the natural chemistry of soil, and how by working towards a balance we can make the most fertile soil imaginable. More class gleanings to come...my brain is still processing all this new information.